I'm still working hard to continue creating new surface patterns and placement designs to show exclusively at the event and I'm loving every minute of it! As well as meeting with potential customers and clients, I'm equally excited to catch up with other designers, some of whom I've met virtually and others I'll meet along the way. If you are exhibiting or walking the show, do drop me a note and I'll be sure to look out for you. 3. I like to play "Learn to Speak Spanish" audio books in the studio while I work. Si es my bien! 4. 2 Broke Girls makes me laugh like a crazed hyena in need of air. 5. When I'm at home working, 9 times out of 10 I have a sausage dog on my lap! Go, on let's here about you! I just wanted to share a quick post to show how I save my images for uploading online. Facebook in particular has a habit of leaving your images looking blurry and pretty unprofessional, especially if you have any text or lines on a white background. The best way I've found to avoid the dreaded fuzziness, is to save my files as a PNG rather than .jpg. If you are new to Photoshop or Illustrator I may sound like I'm talking gobaldygook - but bare with me, it's dead simple! 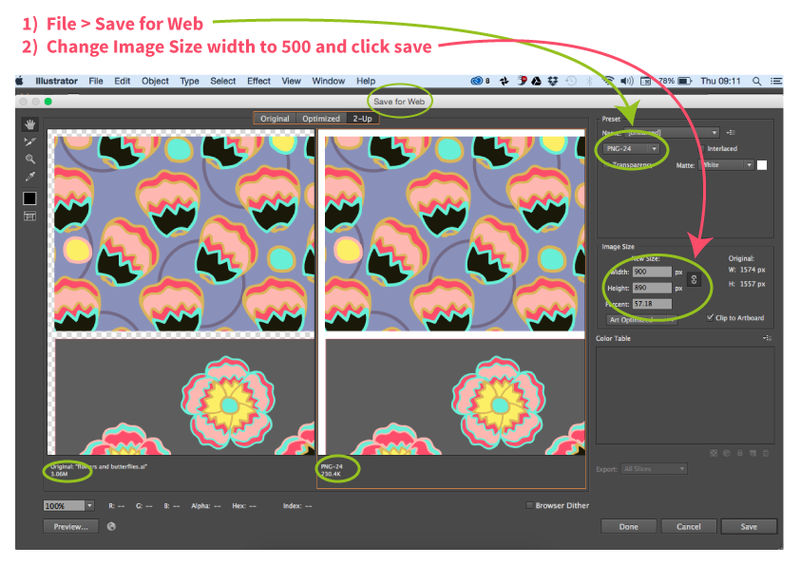 When you are ready to save your pic, select file > save for web (not just "save", or "save as") and the above window will appear. This window allows you to preview the "optimized" image before saving, which is great because not only can you see the effects of the changes you make as you play around with the options on the right (I'll get to those in a moment) but you can also see how big the image will actually be. So, on the right hand side, in the "Presets" area, select PNG-24 from the dropdown. I also like to click on 2-Up (at the top of the image preview) so I can easily see the difference between the original and optimised image as I update it. I then change the width of my image to 450-500 (making sure I don't click on the chain link, so that the proportions of my image remain in tack and the image doesn't become stretched or squashed). Here's a little peak at one of the patterns I've created for a Mathematics theme. 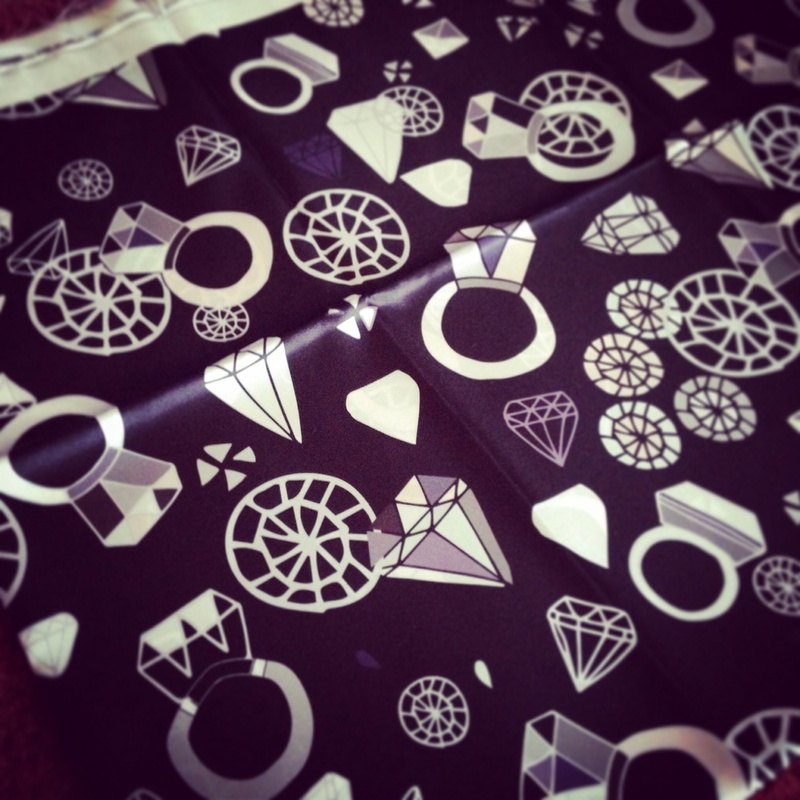 Featuring triangle, this lovely balanced geometric pattern is going to look great on a set of cushions! When the clock struck 7am this morning, the usual "nooo, it can't be morning already, just five more minutes" reaction was quickly replaced by excitement and "let's do this". 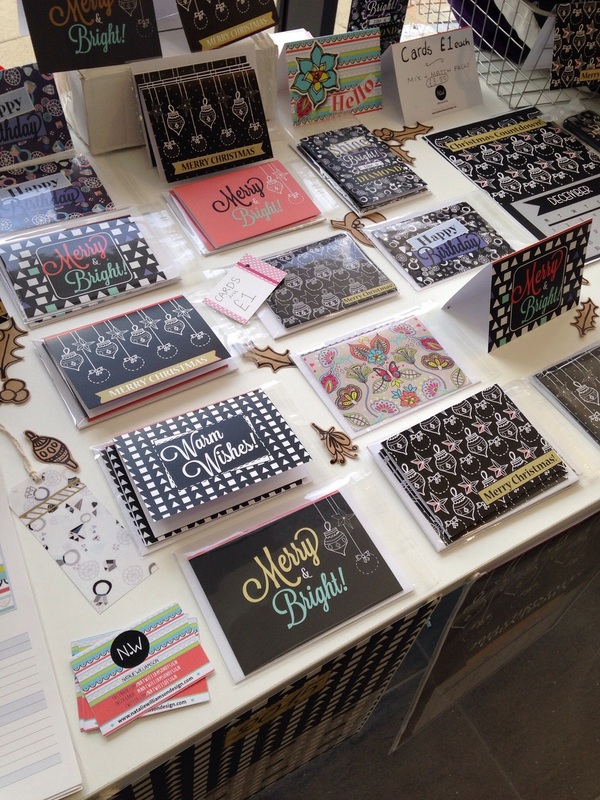 For today was the annual Christmas Showcase Exhibition - whoohoo! As part of Enterprise Week, a selection of local businesses gathered to hold stalls at the University of Huddersfield - for one day only! It was lovely to meet other local businesses and my stall neighbors Becca Buttons and Hettie Amelia helped make the day all the more enjoyable! Be sure to like facebook.com/natwilliamsondesign and follow @natwillsdesign to be the first to hear about new events and promotions! And so I have reached the end of a much enjoyed, thoroughly stretching and exciting 5 week course by Lilla and this is my final piece of work. MATS Part A has been a massive eye opener for me and has challenged me massively while giving me so much inspiration and direction. I still have the rest of this year's Bootcamp to look forward to next week, but I will definitely miss the daily posts and weekly skype videos from the legendary Lilla Rogers. This week's market focus was Gift. Covering anything from bags, to stationery, to you name it! Hyper-Lush, ram packed gorgeousness was the aim and I'm pretty happy with the outcome. Last week's MATS focus was all about the Wall Decor market. Tasked with creating a collage piece of wall art using traditional methods (at least for some parts of the process), I took to my beloved and neglected acrylics and went out to find new canvas boards and brushes. To make matters more challenging I had to work mainly with two set colours based on my star sign, accompanied by as many neutrals as I liked. I began by looking for inspiration of colour combinations and all the countless shades and variations of my two focal colours. I played around mixing paints, pushing each to their hypothetical boundaries, mixing blue until it was almost green but not quite, yellow to almost orange and everything in between. I have been working on illustrations for the Fox and the Crow and I'm pleased to have finished the above double page spread. I began the project by reading and re-reading the fable, picking out and roughly sketching anything that stood out to me and any images that popped into my head. 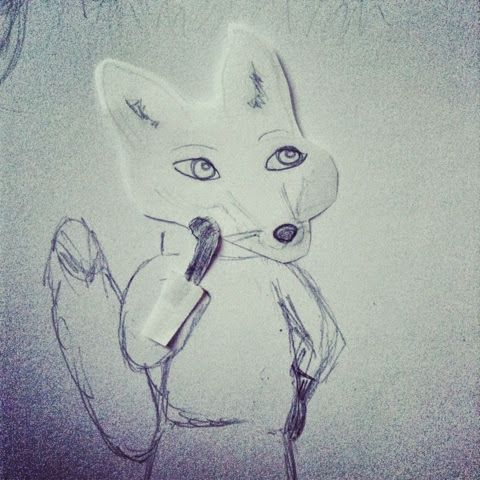 I decided to begin with the part of the story where the fox decides he wants the cheese and puts his plan in motion to get it. I felt this part captured key characteristics of both the fox and crow the most and had a lot to work with. Swarve and charming, he takes a moment to think up a cunning plan to effortlessly get the cheese he wants from the crow. Sat in her tree, her home, she lavishes the flattery and complements. Quick to believe the compliment bestowed upon her! Feminine, vein and perhaps a little gullible. With the above in mind. I began sketching ideas for the scene and poses and expressions of the characters. Creating variations of the eyes, eyebrows and paw/hand of the fox I experimented with his expressions. Once I decided up the most suitable parts to pull together from my sketches, created vectors of my characters in Illustrator using my sketches as a guide. I decided to redraw the main elements of the scene in illustrator, working in layers which I could easily move around and edit until I had everything positioned as I wanted it. The lettering was created by hand, scanned and vectorised before importing into Photoshop to position. Having my weekly flip through Stylish Magazine, I found this week's colour inspiration. Page after page of gorgeous clothing and photography in this delicious Sundae colour palette - I love it! Below, I've pulled out my favourite pages via http://www.stylist.co.uk and created colour swatches. Colour really does make me happy and I love nothing more than working in a cheery colour set. Feel free to use the colour swatches below for your own work and share what you come up with, I'd love to see. This week I have been working on a cover and double page spread for one of Aesop's Fables, The Fox and The Crow and I thought I'd do a quick work in progress post. 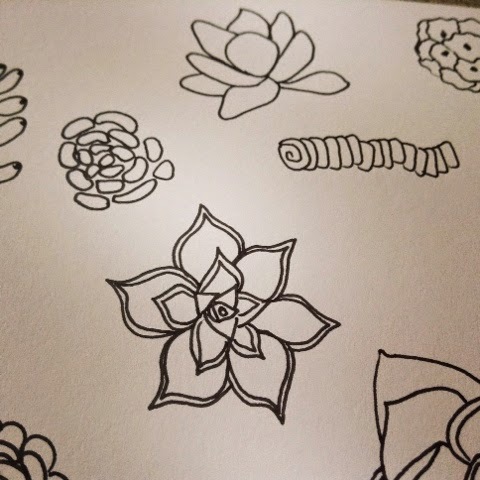 Here are some of my sketches and experiments. One of the things I've picked out to illustrate is the point where the Fox thinks up his plan to trick the Crow into dropping her cheese. To begin with I'm working on the fox's expression and stance as well as his demeanour and presence. He needs to be cunning and plotting but not scary or malicious. Once I came up with a face and body shape I was happy with I found that cutting out his body parts was a useful way of changing up his pose to get it just right. I've been busy tweaking and working up my Summery succulent design for more kitchenware and linens. Summer's coming and the brief for this plate set was just what I needed to get into the summery mood. The sun's shining, you're hosting your first BBQ/Garden Party of the year and you want to wow your guests with not only your hosting skills but your lush new crockery and perfect flower bed. My mission was to help with the former. Not your average floral print, these summery succulents are a colourful treat for the eyes. Unusual but beautiful none the less! This Nat Williamson Tropical Vintage Print was originally designed to a brief set by Lilla Rogers' for the bold fabric market. I think it lends itself really well to home furnishings and would love to get some of these gorgeous colours in my kitchen and living room! Image from http://www.succulentsandsunshine.com great site, check it out! This week I am focusing on design for the home decor market. Florals are always popular and (excuse the pun) spring up every year. That said, it's no good churning out the same old same old print. The trends evolve and a new and fresh take on an old favourite is always well received. 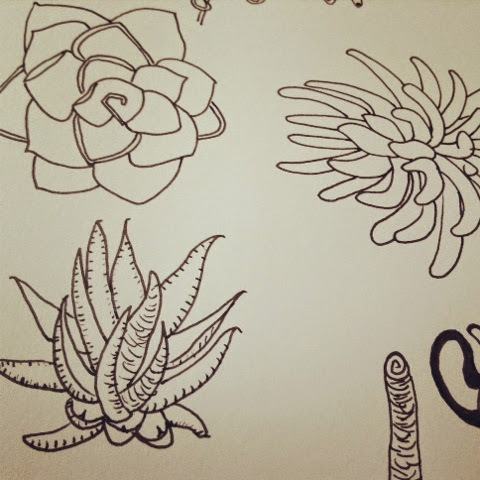 I'll be focusing on the weird and wonderful shapes, colours and vibes of succulents. They're gorgeous, unique and a little odd - the perfect subject matter for an updated florally look. Thanks to Lilla Roger's coaching in MATS, my approach to working on a new design or print of a specific theme or object has changed. I begin by taking time out to really look at details and shapes to get familiar with what ever I'm drawing. I do this by sketching observations, looking at key things that stick out to me, jotting any notes, ideas or thoughts down as I go. I'm not concerned with having any of these sketches for the final piece at this point. The main focus is to experiment, warm up and get confident with the subject matter. Then I can step back, see what's working. Have any interesting shapes become apparent, does a certain sketching style work well? What do I need to redraw? I tend to switch between pen, pencil, brush pen, and watercolour (used more for line work than anything else). 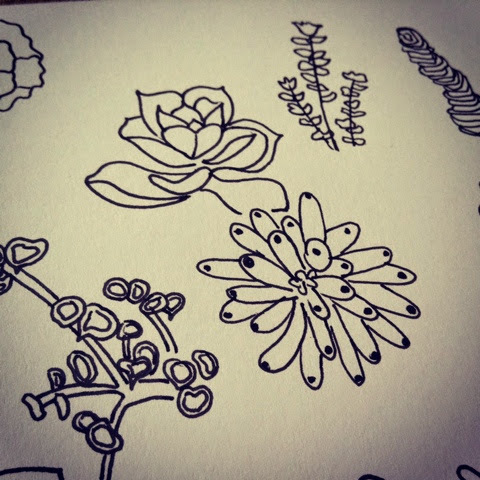 I also so some sketches digitally, working on my Wacom Cintiq away from the computer, then saving the sketches either as pdf layers or a flat png if I know I'm going to take the drawing straight into illustrator. Once in Illustrator I live trace all my images, playing around with the settings until the traced images are a true enough representation of my original sketch. Sometimes this just doesn't work, so I will re-draw the object in Illustrator. Now comes the tedious part. Ungrouping, deleting, manipulating, regrouping and organising onto layers. Time consuming but I actually enjoy creating multiple variation of my icons using, the different segments and creating silhouettes. At this point I should be left with only my favourite pieces and a few "hmm maybe you'll work somewhere" objects ready to be arranged and recoloured. I upload my colour swatches or create new ones and off I go! Here is a quick tutorial on how to create colour swatches in Adobe Illustrator CC. It’s Monday morning and last night was the end of my first Week in one of the worlds best illustration agents, Lilla Roger’s class: Make Art that Sells, or MATS for short. It’s been a full on, informative, creative, motivating, non stop journey but boy am I glad I signed up! The first week of the course focussed on the Bolt Fabric market. Through out the week I gained a insight into the market and what potential buyers are looking for. I was set the task of illustrating tropical fruit and vintage casserole dishes and any other vintage kitchen items I saw fit! Since I’m about to embark on this week’s work: Focusing on Home Decor, I thought I should note down exactly how I got through the week, if only to remember what I did and in what order. I must admit some time was wasted by me wondering “what should i do now?” and “where do I start” but now that I’ve done the first week and have ended up with a piece of work that I’m happy to put my name on (even though I still want to tweak it here and there), I feel confident and energised to crack on and step it up a gear this week. I started by sketching and observing and more sketching, more looking, more sketching and more sketching - lots of fun! Note to self: if something isn’t working, take it out or replace it. Love every single icon in your piece! I picked out some distinctive motifs that I thought would work well for a coordinate and using the pattern tool, created a repeat block pattern. I selected another colour from my palette for the background. I had lots of icons left over which is no bad thing. I've started a resources folder which includes textures and background images I've taken myself or created as part of other projects but haven't used. Everything is organised in categories so I can easily find select from them in the future - waste not, want not! When I started pulling the main pattern together, I was trying to create a "full print" but as I began working on arranging my icons, I ended up creating almost rows of motifs. To link every thing together and make the piece flow nicely I added the indication of vines running up and between motifs. I would like to go back to one of the previous points in my design (screen shot) and finish another version in a full print as I think it will lend itself better to more final products. I also thought about adding a white boarded or shifted “shadow” behind each of the main motifs to bring them to the foreground. If I get time I will go back and see how this works out. I learned a way to set each of my objects in Illustrator to a new photoshop layer. This will be the best way to do this so I can open the print on PS and easily add the additional white shapes. Although Illustrator is create for creating my patterns, I’ll be able to manage the shapes and layers more efficiently in Photoshop at this point.